Truth And Love After 40: Oh By The Way.......Meet My State's Defender Of Traditional Marriage. Oh By The Way.......Meet My State's Defender Of Traditional Marriage. Governor Jim Gibbons vetoed Nevada's domestic partnership bill on Memorial Day. This is late in coming because I haven't been able to digest it very well. We knew he would. Jim Gibbons is not nor ever will be a person of sound reason nor intestinal fortitude when it comes to being governor. He isn't a stand up guy either. I won't totally discredit his guts, he served in Vietnam and the first Gulf "war" and earned many medals. But in all truth, he makes Ron Blagojevich look like an amateur. He defended himself by stating "that he wanted his wife out of the Governor's Mansion because she was aggressive: "It was once said in another context that being in close quarters with such a volatile person was like being locked in a phone booth with an enraged ferret." Oh I guess she was pissed off about the other women and the sexual assault charges. Doesn't she know her place??? He is just one of many upstanding defenders of "traditional marriage." 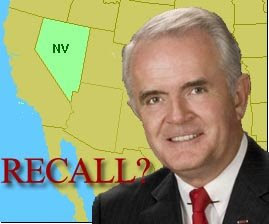 In October 2006, near the conclusion of his successful campaign for governor, a woman accused Jim Gibbons of attempted sexual assault in a parking garage. Gibbons claimed he was helping her to her car. They both admitted to drinking alcohol at McCormick and Schmick's restaurant in Las Vegas. In the initial aftermath of the event, Las Vegas Sheriff Bill Young, a long time supporter of Jim Gibbons and donor to his gubernatorial campaign, cited lack of evidence in the case and refused to bring evidence of the attack to the District Attorney. The accuser did not initially want to pursue pressing charges, saying she just wanted "to be left alone." But when the Las Vegas Metropolitan Police Department was forced to open the incident case file after inquiries by Las Vegas media, the Las Vegas Review Journal and the Las Vegas Sun released her name and she was thrust into the public eye. She later said she was being pressured to not talk to the police about the incident by people close to Jim Gibbons. In fact, the Gibbons campaign hired a private investigator to "talk" to the woman shortly after the incident occurred. Under pressure from the media and eventually from the accuser herself, Sheriff Bill Young famously taunted the alleged victim to "bring it on" and sign a formal complaint. This was a highly irregular step, as most victims of assault are not required to sign a complaint before an investigation can begin. Nevertheless, she signed the complaint and there was a further investigation. The evidence was given to the Las Vegas District Attorney, David Roger, who had also donated to the Gibbons campaign. Criminal charges were never filed in the case. This year, the alleged victim has filed a civil suit against Jim Gibbons, specifically alleging battery, false imprisonment and second-degree kidnapping as well as deceit about the episode. A speech given in February 2005 by Rep. Gibbons in Elko, Nevada was actually plagiarized from a copyrighted speech delivered in 2003 by then-Alabama State Auditor Beth Chapman at a "Stand up America" rally. On November 1, 2006, the Wall Street Journal published a story stating that Gibbons had earmarked several millions of dollars to a company owned by Warren Trepp, as well as added additional funds to a pre-existing government contract with Trepp's company. The report noted that Trepp had paid for a $10,000 cruise for Gibbons and his wife, which Gibbons failed to report, and $100,000 in campaign contributions. 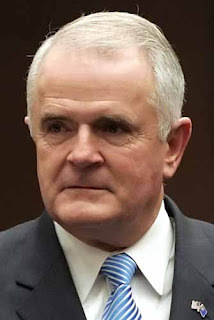 A former Trepp business partner claimed that Gibbons was also given gambling chips – convertible into cash – and cash directly. On February 15, 2007, the Wall Street Journal reported that Gibbons was under federal investigation for allegedly accepting unreported gifts and/or payments from Trepp in exchange for official acts while he served in Congress (1997–2007). The U.S. Attorney for Nevada at time of the investigation was Daniel Bogden, who was one of seven federal prosecutors forced out of his job by the Bush administration in December 2006. Gibbons set up a legal defense fund just before the November, 2006 gubernatorial election to help pay for legal expenses incurred after a woman accused him of attempted sexual assault. Gibbons neither reported the legal defense fund to the appropriate U.S. House of Representatives committee (even though he was a sitting congressman at the time and was required by House rules to do so), nor did he report donations to his legal defense fund as contributions to his gubernatorial campaign, citing the money was for "personal use" and not for "political purposes." * Investigations into the allegations that Gibbons secured defense contracts for his friend Warren Trepp in exchange for gifts and money during his time in Congress, 1997-2006. * A nepotism scandal regarding Sierra Nevada Corporation's hire of Nevada first lady Dawn Gibbons as a consultant. Sierra Nevada paid Dawn Gibbons $35,000 at the same time Jim Gibbons helped the company get a no-bid federal contract. AB 121: Requires hospitals in Washoe and Clark counties to create a staffing committee and staffing plan that addresses nurse-to-patient ratios. Gibbons said the bill "unnecessarily legislates" an area that should be left to medical professionals. Nevada has a serious nursing shortage. AB 473: Requires additional medical emergency training for corrections staff and a better inventory of dental and medical supplies. Gibbons said the requirements already exist in current law. Medical supplies disappear like crazy from our jails and prisons. * In January 2007, Governor Gibbons asked Nevada lawmakers to approve his budget that cut the percentage of education funding in Nevada to increase the percentage for public safety and human services programs. * In 2008, Gibbons suggested that the Nevada legislature cut the state general fund budget for elementary, secondary and higher education by 14% (this does not include federal or local revenues, or funds for construction or teacher penions). Jim Rogers, Nevada Chancellor for Education, said of the budget cuts, "We’re talking about something that is going to cripple us financially and competitively. The effects will be felt on our economy for the next 50 to 100 years." His record on education as a Congressman. * Rated 10% by the NEA, indicating what the group considers "anti-public education spending" votes. * Voted YES on allowing prayer in public schools during the War on Terror. * Voted YES on letting public schools display the words "God Bless America." * Supports a Constitutional Amendment for prayer in public schools. * Gibbons supports "No Child Left Behind." Meet The Boys: From a late in life family. Sometimes, you just gotta say it! The Semester is Over, and of course Oklahoma! A Great Time In Oklahoma! In the end, gay people want what everyone wants, we all want to belong, to be loved, to serve, to look beyond ourselves to purpose and meaning in the world. "No civil rights movement has EVER lost. Never. It is not a matter of if our community will win full equal rights, including marriage. It is only a matter of when. But as in all civil rights movements, we will have to fight like hell for it."